This is an opportunity for patients who have had breast cancer treatment to be part of a clinical trial in New York … Thank you to the Lymphatic Reasearch Foundation for bringing this to my attention. A team of surgeons and members of the breast cancer program of the Herbert Irving Comprehensive Cancer Center at NewYork-Presbyterian Hospital/Columbia University Medical Center is conducting a two-year pilot study of an innovative microsurgery technique coupled with imaging technology to not only prevent lymphedema but also potentially detect and treat it early. Lymphedema, the accumulation of lymph fluid in the arm and painful swelling due to blocked lymph drainage, occurs in up to 13 percent of breast cancer patients after sentinel node biopsy and external-beam radiation, increasing to 40 percent following complete axillary lymph node dissection (ALND) and radiation. Lymphedema can also affect other cancer patients. Surgery and radiation after lymph node removal can cause scarring that blocks the lymph ducts, not only in the underarm but also in the legs, groin, pelvis, or neck after treatment for uterine, prostate, ovarian, or prostate cancer, as well as lymphoma and melanoma. It can be difficult to treat lymphedema, which often requires lifelong therapy with compression garments to prevent lymphangitis (inflammation) and cellulitis in the affected limb. The condition can greatly affect quality of life for breast cancer patients and, some studies suggest, is associated with a two-to-three-fold increase in mortality in the six years following a cancer diagnosis. The current study of the lymphatic microsurgical preventive healing approach (LYMPHA) is the first to be conducted outside of the University of Genoa in Italy, where it was developed. Dr. Sheldon M. Feldman, the principal investigator, was invited by the developers, Drs. Francesco Boccardo and Corradino Campisi, to observe their team in 2012. The LYMPHA technique creates a bypass to restore lymphatic flow by connecting lymph vessels to a branch of the axillary vein, a pathway normally severed by node removal or blocked by tissue fibrosis resulting from radiation, says Dr. Feldman, chief of the Division of Breast Surgery and the Vivian L. Milstein Associate Professor of Clinical Surgery at NewYork-Presbyterian/Columbia University Medical Center. Previous techniques for preserving lymphatic flow were lengthy and complex, and surgeons could not predict which patients would develop lymphedema or benefit from intervention. The LYMPHA bypass adds only 20–30 minutes to breast cancer surgery and ALND. “In addition to removing all potentially cancerous lymph nodes, we can now restore lymphatic flow and reduce the patient’s risk of developing lymphedema,” says Dr. Feldman. Prior to ALND, a blue dye normally used to identify sentinel nodes is injected into the upper arm to map the lymphatic circulation from the arm. During the node dissection, the surgeon preserves a branch of the axillary vein and keeps a suitable length for reaching the lymphatic vessels. 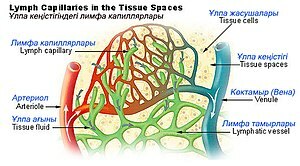 The vein connection, or anastomosis, is then performed by a microvascular surgeon, using a sleeve technique in which the lymphatic vessels are inserted into the cut end of the vein to restore normal lymph flow. A mastectomy is performed at the same time as the node removal and LYMPHA procedure. Before their surgery, study patients undergo an imaging technique known as lymphoscintigraphy, using a radiotracer such as technetium, and bioimpedance spectroscopy with a device called the L-Dex, to establish baseline lymphatic volume in the arms. In addition to the regular follow-up visits normally scheduled after an ALND, postoperative monitoring includes physical exams for lymphedema, lymphoscintigraphy, and L-Dex bioimpedance spectroscopy to confirm that the LYMPHA bypass is open and functioning. This study is part of a comprehensive lymphedema management in the breast cancer program at NewYork-Presbyterian/Columbia encompassing education, lymphedema prevention, and, in the future, potential treatment of patients with lymphedema who have not responded to decongestive therapy, which involves wrapping of the limb and specialized massage for drainage. The LYMPHA pilot study seeks to enroll 10 patients with confirmed nodal metastases whose veins are suitable for the bypass. The next step would be a multicenter trial throughout the U.S. to confirm the efficacy of the LYMPHA procedure. Eventually it could become the standard of care for cancer patients needing ALND. The lymphatic-venous bypass could also potentially be used to treat patients with lymphedema that is not well controlled with decongestive therapy. The earlier treatment begins, the more likely the condition is to be reversible. To be considered for the study, breast cancer patients needing lymph node dissection should contact Amiya Vaz at 212-305-1317 or by email at: av2454@columbia.edu.